A powerful phone with less-than impressive storage space is potentially one of the most peeving situations imaginable. And apparently KINGMAX seems to agree, as the Taiwan-based manufacturer has debuted the world’s first-ever 64GB microSD card, which should be sufficient for just about everyone. 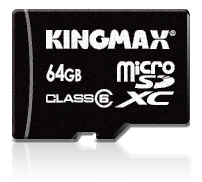 The 64GB microSD card from KINGMAX can store approximately 30,000 digital photos (in their original resolution), more than 2,000 albums, or 24+ hours of 720p HD video. The card touts a Class 6 rating, or in other words, the card can read and write data at speeds up to 48 Mbps. What’s more, KINGMAX added error correction control, and promises low energy consumption, all protected by a lifetime guarantee. Pricing and availability have yet to be announced, but it shouldn’t be too long before we get some word on when and where we can pick up this impressive new microSD card. Plus, we expect that KINGMAX will want to get this on shelves as soon as possible, lest some other manufacturer come up with a 64GB microSD card and beat KINGMAX to the punch.